Written, directed, and starring Charles Chaplin, with additional direction by Wheeler Dryden, The Great Dictator is a satirical film about a Jewish barber who returns home learning that his country is under the rule of a brutal dictator. The film is Chaplin’s commentary towards the emergence of Nazism and Adolf Hitler at a time when World War II was in its early stages. Also starring Paulette Goddard, Reginald Gardner, and Jackie Oakie. The Great Dictator is an outstanding satire from Charles Chaplin. After saving a man’s life during a battle in World War I, a Jewish war private (Charles Chaplin) has been hospitalized for twenty years as his country of Tomainia goes through a change of politics following its loss. Now under the rule of the ruthless dictator Adenoid Hynkel (Charles Chaplin) who hopes to rid of Jews from the country and rule the world. After leaving the hospital, the Jewish man returns to find his barbershop abandoned and unaware of how much the world has changed when he gets into a fight with a couple of storm troopers. With help from a young Jewish woman named Hannah (Paulette Goddard), the Jewish man is later saved by Commander Schultz (Reginald Gardner) who remembers the man since he saved his life back in World War I. With the tension between storm troopers and Jews living at the ghetto calmed down, Hynkel along with his interior minister Garbitsch (Henry Daniell) and war minister Herring (Billy Gilbert) are planning an invasion of Osterlich though funds are depleting as people are becoming upset. When Hynkel learns that Schultz had been going against his plans, Schultz is arrested only to flee into the ghettos where he organizes a suicide mission to blow up Hynkel’s palace. Instead, he and the Jewish barber are captured as they’re sent to camp. Hannah and her Jewish neighbors flee to Osterlich unaware that Hynkel is set to invade. Yet, Hynkel learns that Benzino Napaloni (Jackie Oakie), the dictator of Bacteria, also intends to invade Osterlich. Though he intends to fight Napaloni, Garbitsch suggests that Hynkel should invite Napaloni to Tomainia to discuss the invasion. Things go well until a party where Hynkel and Napaloni have a fight only to have Garbitsch and Napaloni’s ambassador (Carter DeHaven) smooth things out. Yet, Hynkel secretly decides to do the invasion only to have things go wrong for him following an escape from Schultz and the Jewish barber. When the barber is suddenly mistaken for Hynkel and the invasion going on, it’s up to the barber to give Hynkel his big moment. The film was made during Adolf Hitler’s rise as World War II is just happening following Germany’s invasion of Poland in September of 1939. With the world knowing about what Hitler and Nazi Germany is doing along with Benito Mussolini and Fascist Italy, how would one respond to what is going on? For Charles Chaplin, he uses comedy and satire to comment on the state of the world by mocking Hitler and bring attention to what is happening with Jews. While he maintains his own pantomime style for the film, it’s also the moment that Chaplin decides to speak as he leaves silent comedy behind. The film opens with a battle scene as Chaplin’s Jewish barber character is a man trying to help out in battle while he ends up saving this man’s life as it starts out as a funny war film. Then it becomes a bit grim through footage of newsreels and newspaper headlines about the changes of Tomainia as Chaplin goes into this intense yet captivating role of this dictator who is a bit of a klutz as well as a dreamer. Chaplin brings a lot of humor the Hynkel character as a man who walks from room to room either to be given a portrait or to deal with everything else as a leader. Chaplin humanizes the character a bit though he really portrays Hynkel as a buffoon who is just obsessed with being the emperor of the world. The script moves back-and-forth into the story of this ruthless dictator and this ordinary Jewish barber who falls for a young woman as they try to deal with the oppressive world they live in. Yet, Chaplin allows things to be improvised throughout the film in his stylized yet freewheeling direction. From the physical interplay between he and the actors to the way he keeps the camera moving for a lot of the big comedic moments. Chaplin does put in a sense of dread through the newsreel scenes and in scenes where storm troopers abuse the Jews in the ghettos. Still, Chaplin finds a way to put humor throughout the scenes in the ghettos while balancing it with light drama. Chaplin’s approach to the scenes involving Hynkel is satirical in the way he frames Hynkel in the middle as he’s going to give a speech. Using stock footage for crowds, it’s to emphasize the power that Hynkel holds among his people. The stuff with Napaloni is Chaplin also taking shots as Mussolini through slapstick while setting up for the film’s climatic moment. The film’s ending has Chaplin breaking character and breaking the fourth wall in what is definitely the film’s most powerful moment. Overall, the ambition that Chaplin lays out for and what he wants to say is truly among one of his greatest films of his career. Cinematographers Karl Struss and Roland Totheroh do great work with the film‘s black-and-white cinematography from the polished yet gorgeous look of the palace scenes where Hynkel lives in. The photography also has a simple look of the ghetto along with some grainy shots for parts of the opening battle scene. Editors Willard Nico and Harold Rice do amazing work with the stylized editing with the use of transition wipes, dissolves, and fade-outs to help the film move at a brisk yet leisured pace. Art director J. Russell Spencer and set decorator Edward G. Boyle do wonderful work with the set design for the Hynkel palace along with the look of the cannons for the battle scene while giving the scenes of the ghetto something refined rather than go for grit which was a style of the time. The sound work of Glenn Rominger and Percy Townshend is superb for creating an atmosphere from the battle and crowd scenes to the intimacy of dramatic scenes. The music of Charles Chaplin and Meredith Wilson is brilliant with its bombastic yet sweeping orchestral score for some of the film’s more political-driven moments to serene yet dramatic pieces for the romantic moments of the film. The soundtrack also includes a couple of pieces from Johannes Brahms and Richard Wagner plus a brief piano piece of Luigi Boccherini played by Chaplin as the music is a major highlight of the film. The casting for the film is phenomenal as it features some memorable appearances from Bernard Gorcey as the helpful Mr. Mann, Maurice Moscovitch as the businessman Mr. Jaeckel, Carter DeHaven as the Bacterian ambassador, and Grace Hayle as Napaloni’s wife. Billy Gilbert is funny as the inept war minister Herring who keeps trying to please Hynkel with ideas only to mess up. Henry Daniell is very good as Garbistch, a pun on Joseph Goebbels, who tries to maintain order and keep Hynkel in check for the big invasion. Reginald Gardiner is excellent as Schultz, a war officer who helps out the Jewish barber as he owes the man a great debt during a mission in World War I.
Jackie Oakie is extremely hilarious as Napaloni by making this variation of Mussolini into a brash, arrogant buffoon who tries to show Hynkel how cool he is. Paulette Goddard is wonderful as Hannah, a Jewish woman who tries to deal with the storm troopers while finding an ally and love in the Jewish barber as Goddard displays a great sense of radiance and energy to her performance. Finally, there’s Charles Chaplin in a towering performance in the dual roles of the Jewish barber and Adenoid Hynkel. For the barber, Chaplin brings in elements of his famed tramp character while bringing a soft-spoken approach to the character as a man that just wants to live a simple life without compromise. In the role of Hynkel, Chaplin brings this amazing attitude with great mocking accent as well as a funny, melodramatic approach to a man that wants to rule the world. The Great Dictator is a witty yet thrilling satirical comedy from Charles Chaplin as it is among one of his best films of his celebrated career. This film isn’t just one of Chaplin’s best works but also one of the best comedies ever made as it’s a film that really speaks out at the atrocities of Nazism as the time it was released in 1940 as well as a commentary of the state of the world. It is also a very daring film from a filmmaker who uses his talents to make fun and say what he felt was needed to be say without being too preachy or be too silly. 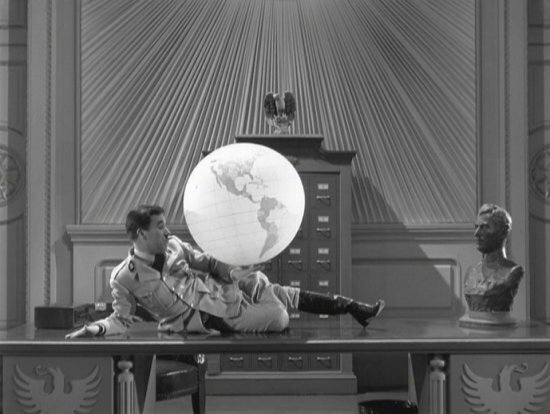 In the end, The Great Dictator is a marvelous comedy from Charles Chaplin.